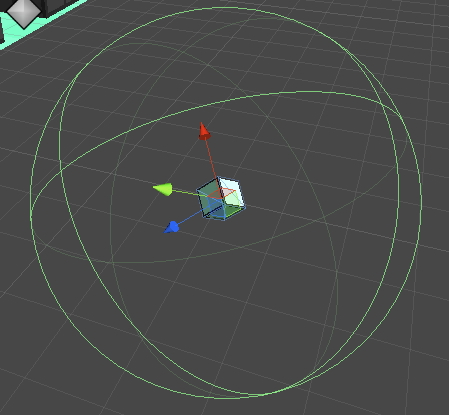 An in-depth guide about how to make a nice little Tower Defense game in Unity. Everything will be explained step-by-step so everyone can understand it. In this Tutorial we will create a little three-dimensional Tower Defense game with a completely unique graphics style. 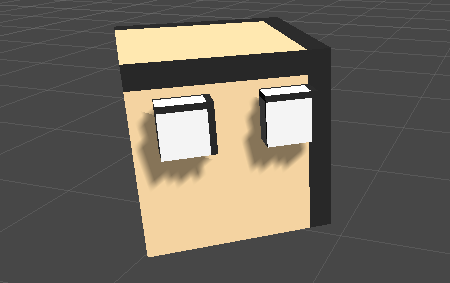 The game will be very easy to make, won't need any 3D modeling skills, no animations and nothing that is complicated. It will be so simple that all we need are 90 lines of code. Our Tutorial does not require any special skills. If you know your way around Unity and heard about GameObjects, Prefabs and Transforms before, then you are ready to go. And if you didn't, don't worry about it too much. And don't worry, there will be no scary math involved! Our Tower Defense Game will be made with Unity 5.3.1f1. Newer versions should work fine as well, older versions may or may not work. 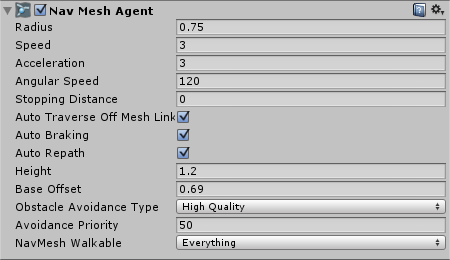 We won't need any advanced effects, so the free version of Unity will do just fine. 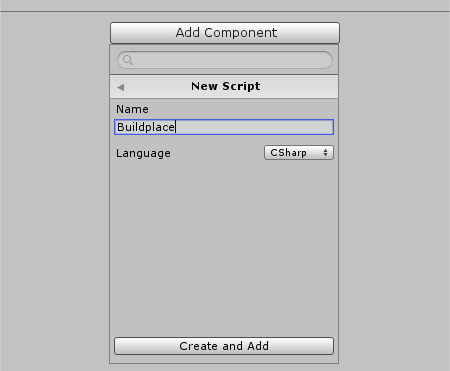 In addition, we will use Buildplaces. 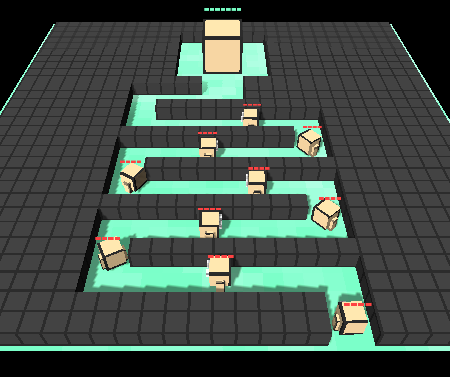 Buildplaces are predefined places on the map where the player can build Towers on. We will use them because it will make our lives much easier later on (in compare to being able to build towers everywhere on the map). We have two options: either we go for something realistic which will take hundreds of highest quality 3D models, Textures and Shaders, or we go for something simple but unique. Our motto is Talk to me, like I'm five!, so we will obviously not go deep into the CAD tools world to create realistic 3D models. 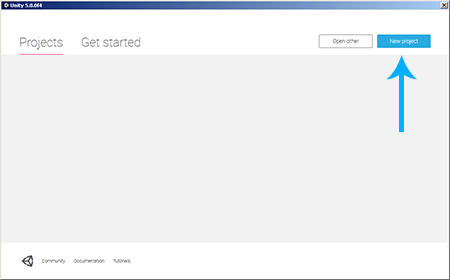 Instead we will use a completely minimalistic style that saves us a lot of work, yet looks interesting. 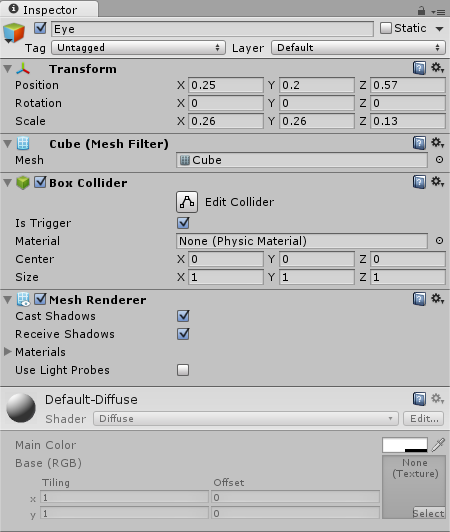 We will make use of Unity's primitives (cubes, spheres, cylinders, ...) in combination with only a few colors (mostly green, yellow and gray). The best thing about this art style is that everyone can create it in less than one hour of work and without any 3D modeling or animation knowledge at all. 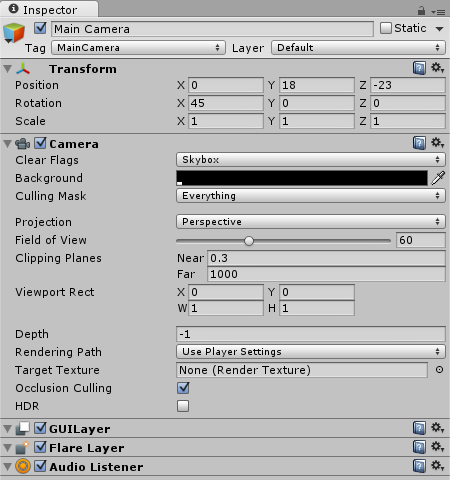 Note: this will make the camera look down onto the game world in a 45° angle later. Note: we can basically use any settings that we want, but the ones above will look really good. Note: this will be the perfect size to fit all the Buildplaces and the castle. 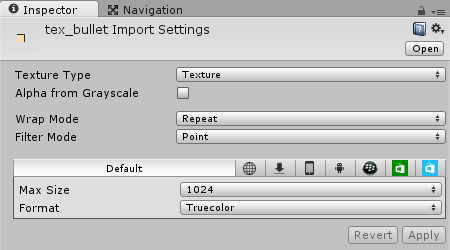 Note: right click on the image, select Save As..., navigate to the project's Assets folder and save it in a new Textures folder. 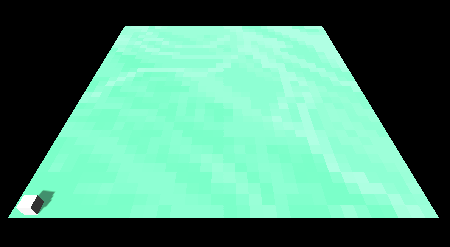 Note: we will use this style for all the Textures in our game. Alright, we will need some kind of Buildplace where the player can build a Tower on (instead of being able to build it anywhere in the world, which would be much more complicated). 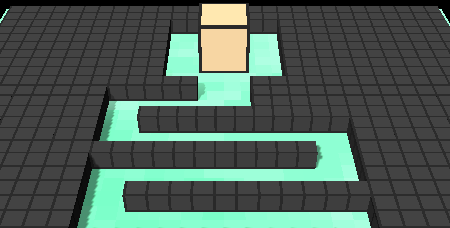 We will begin by creating one Buildplace and then duplicate it a few times so that we can use the Buildplaces to design some kind of maze for the monsters to walk in. Note: the x and z coordinates should always be rounded like -14 (instead of something like -13.99). 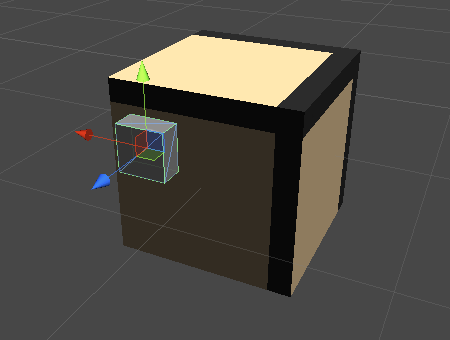 The y position is 0.5 so that the cube stands exactly on top of the Ground plane, instead of being half way inside it. 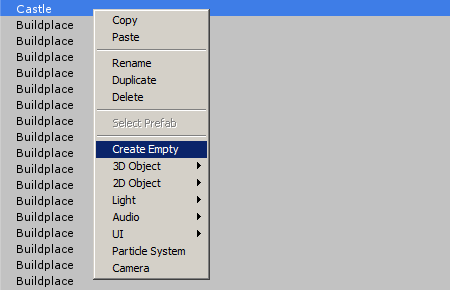 Note: right click on the link, select Save As... and save it in the project's Assets/Textures folder. 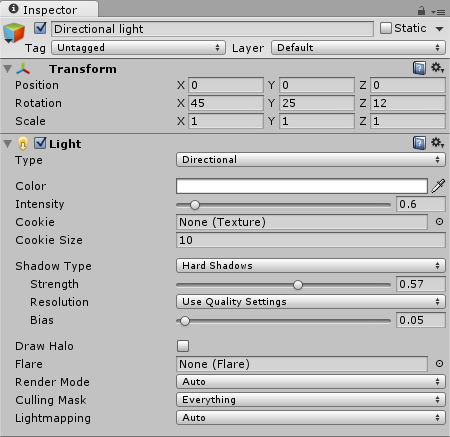 Note: because the towerPrefab variable is public, we can specify it in the Inspector later on. Note: at first we load the towerPrefab into the game by using Instantiate. Afterwards we modify the position to be the current Buildplace's position + one unit upwards. Note: right click on the image, select Save As... and save it in the project's Assets/Textures folder. Alright, let's add some kind of Health Bar to our Castle. There are a lot of different ways to do this, and we will pick the most simple one. We will add a 3D text above the castle that consists of a text like '-' for 1 health, '--' for two health, '---' for three health and so on. Note: the Text property already contains 7 x '-', which equals 7 health. 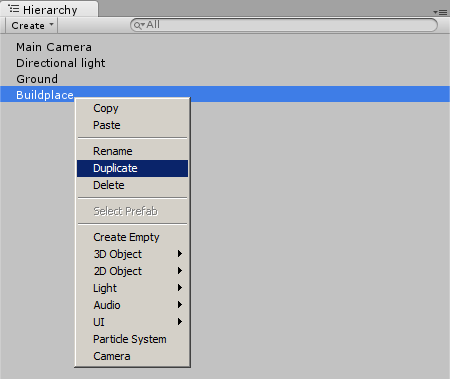 Most of the other properties are changed to modify the font size and sharpness. It's important to also put a Arial (or any other font) into the Font property. We can do this by clicking the little circle on the right of the Font property. 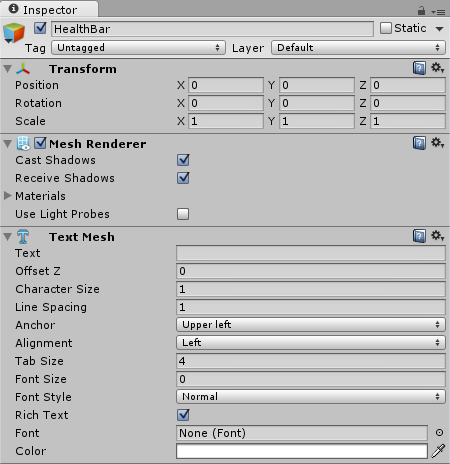 Afterwards Unity shows a list of currently available fonts, where we can select one. Note: there is no complicated math going on here. 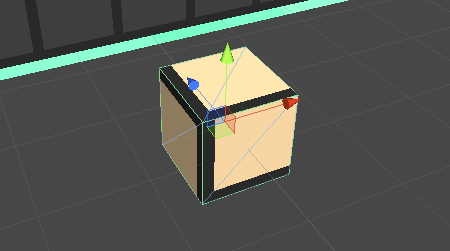 All we do is make our GameObject look into the exact same direction that the camera looks at. Note: this is the only thing that looks a bit weird. Usually we would have some kind of integer variable to represent our current health. 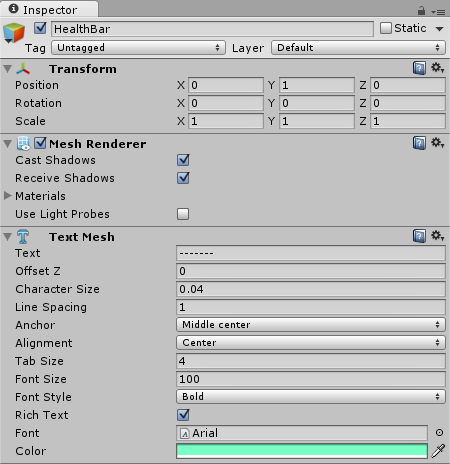 Instead we made use of the TextMesh's Text component that consists of those '-' strings. We also automatically Destroy the Health Bar's parent object (which is the Castle) as soon as the health becomes 0. We made those functions public so that other Scripts can use them. That's it, the simplest HealthBar for our game. And the good thing is that we will be able to use it for the Monsters, too. Let's add a Monster to our game. Usually we would create a Monster with any CAD tool like Blender, Maya or 3DS Max. But since we want to keep things simple, we will use Unity's primitives to create some kind of cube that looks a bit like a monster. 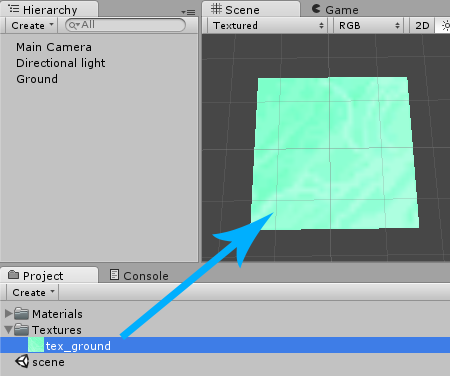 And then drag it onto our Eye GameObject. Our Monster already has a Collider, which pretty much makes it part of the physics world already. There is one more thing to add here though. 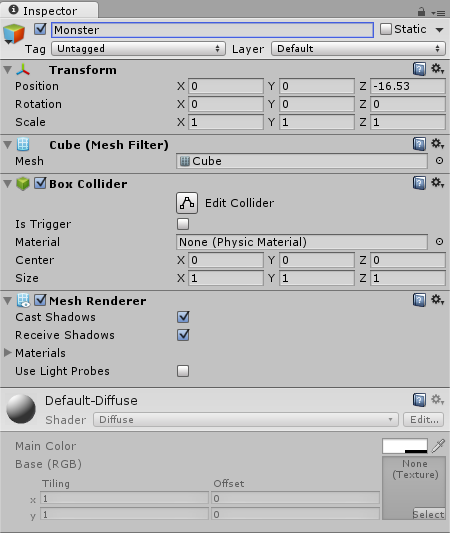 Everything that is supposed to move through the physics world should have a Rigidbody attached to it. 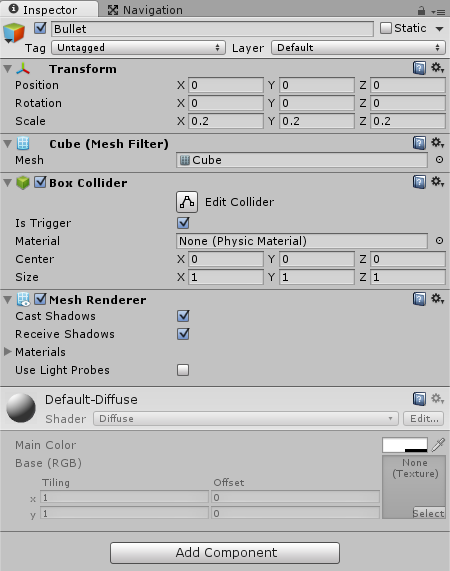 A Rigidbody takes care of stuff like gravity, velocity and other forces that make things move. Note: we pretty much used the default settings here. So let's begin by telling Unity which parts of our world are walkable. 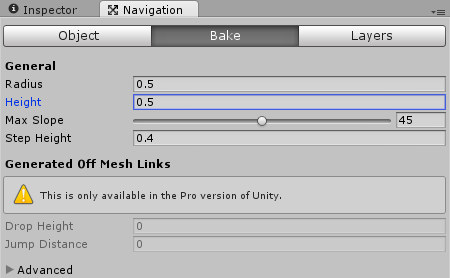 The good news is that Unity actually figures this out on its own. All we really have to do is tell Unity which parts of our world are static (as in: never moving). 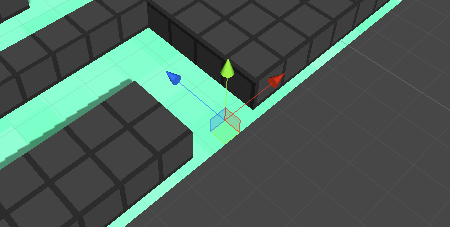 Now Unity knows that those things will never move, hence it will use them to calculate the walkable areas. Note: the important part is the Path through the maze. 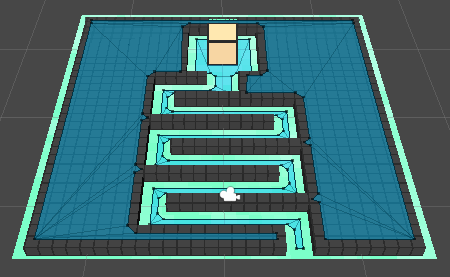 Unity also thinks that the Buildplaces itself are walkable, but since there are no stairs for the monsters to climb up there, it doesn't really matter. Note: we simply modified the movement speed and the size to fit our monster. Feel free to play around with those settings later on if you are not satisfied with them yet. Note: we will do this when we create the Monster Script later. Note: we also changed the Text property to 4 x '-' so that the monsters only resist 4 tower attacks. Okay so as mentioned before, we want to create some kind of Monster Script that makes it move to the Castle and then deal one damage to it as soon as it reached the Castle. 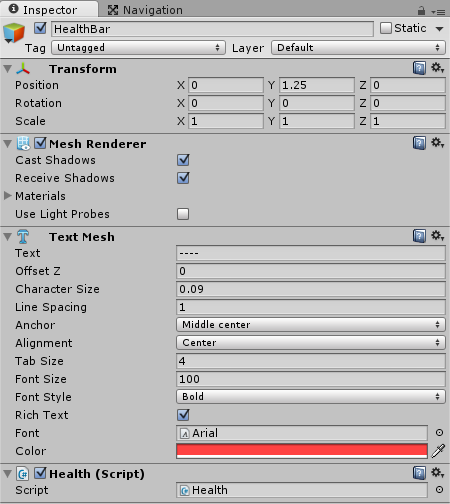 And that was our Monster Script, as usual Unity made our lives really easy here. Note: don't forget to save the Script. Now we don't want our Monster to be in the game from the very beginning. Instead we want to save it as a Prefab so that we can load it into the game any time we want. Now we can load it into the Scene any time that we want by either just dragging it in there from the Project Area, or by using the Instantiate function in a Script (which we will do soon). 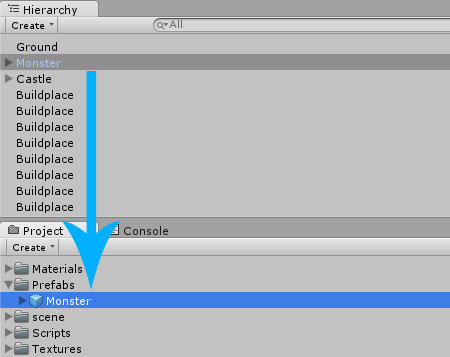 Since we have a Prefab now, we can right click the Monster in the Hierarchy and select Delete. 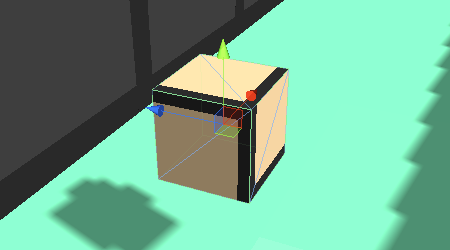 Note: A Gizmo is a visual indicator, it can be used for empty GameObjects so that they can be seen easier. 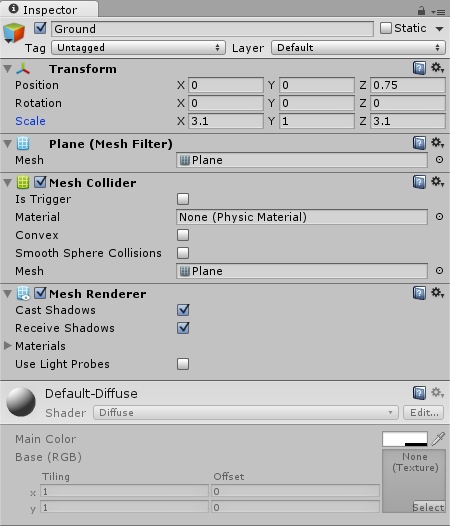 Gizmos are only shown in the Scene view, not in the final game. Note: we enabled IsTrigger so that the bullet is able to fly through walls and hit the monster in any case. Note: the target will be the Monster that it wants to hit. The target will be set by the Tower that fires the bullet. Note: we calculated the direction by subtracting the current position from the Monster's position, which is basic vector math. Afterwards we multiply that direction by the speed. We also used the normalized direction to make sure that it has the length of one. // Still has a Target? Afterwards we can delete it from the Hierarchy, because we don't need it just yet. We already created many Buildplaces where we can put Towers onto, and now it's time to create a Tower. Our Tower model is finished. Now we still have to add the logic that finds a monster that is close to the Tower, and then shoots a Bullet at it. There are many different ways to do this. The obvious way would be a Script that finds all Monsters and then shoots a Bullet at the closest one. While this would work just fine, it would also be really computationally expensive. It's much smarter to add a big sphere Trigger around the Tower and use Unity's OnTriggerEnter function. This way Unity will automatically notify us whenever a Monster walks into the Tower's 'awareness' area. Note: we use GetComponent to find out if whatever walked into the Trigger has a Monster Script attached to it. If this is the case then we use Instantiate to load the Bullet into the game world at the Tower's current position and with the default rotation (Quaternion.identity). Afterwards we access the Bullet component and set the target to the Monster. Afterwards we can delete it from the Hierarchy. 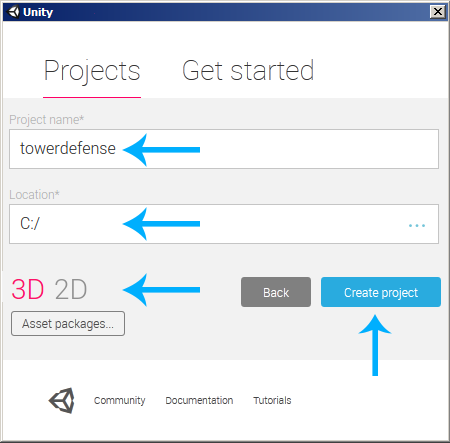 The Unity Tower Defense Tutorial source code & project files can be downloaded by Premium members.